There will be a two-fer post on this one. Melanie shared more of her printed cloth. Swoon! Melly and I spent a little bit of time on the B 750. We borrowed the #24 foot so that I could show Melly some of the features and let her quilt for a bit.. 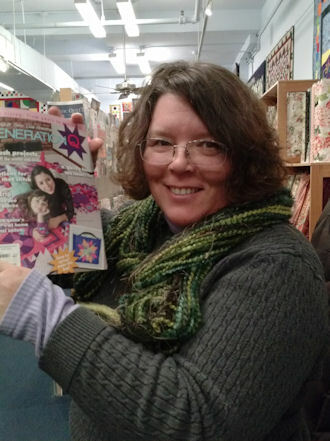 I have to say I was happy to find Generation Q Magazine at the City Quilter. Sara Lawson is adorable and her daughter, just want to pinch her cheeks. We drew a little bit of a crowd while – there was a class inside that came out to watch us for a few minutes. We enjoyed our time with them. 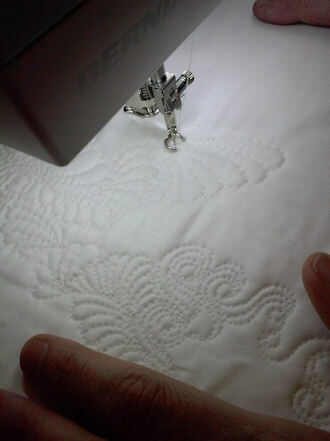 I did a little bit of this quilting and Melly did a little bit of this quilting. I’m not sure if you can see but Melly’s hands show clear signs of dyeing sessions. A little later on we had tea and talked and talked! And talked until it was time to go home. Today is a full schedule including some planning for GenQ, two phone meetings and working at the quilt shop. Would love to see the finish quilting. 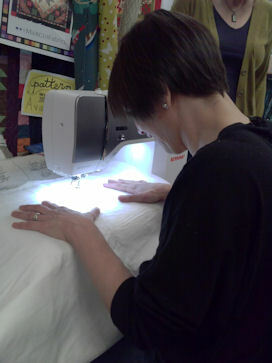 I was showing Melanie how to quilt on a test sample the shop keeps for showing quilters how to use the HandiQuilter.